Insights from Jesus' teachings on what it means to live as a Christian in a world where being a Christian in not popular. - Publisher Life seems to conspire against us, filling our days with busyness. Maybe we do it to ourselves out of need or fear, but the result is often the same" we become surface people, skating on the reflection pond without having or taking time to find depth of character. We live from event to event, from crisis to crisis, hoping no one will check our hearts for compassion and our minds for depth.In "Being a Believer in an Unbelieving World," Wayne Brouwer urges us to listen more closely to the wisdom of Jesus and linger long enough before the mirror of the gospel to find the true shape of our selves. Then, under the gentle prodding of the One who cares, we can take new steps toward living life the way it was intended. 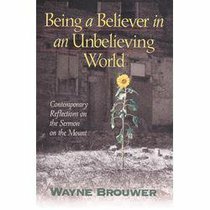 About "Being a Believer in An Unbelieving World"
Life seems to conspire against us, filling our days with busyness. Maybe we do it to ourselves out of need or fear, but the result is often the same" we become surface people, skating on the reflection pond without having or taking time to find depth of character. We live from event to event, from crisis to crisis, hoping no one will check our hearts for compassion and our minds for depth.In "Being a Believer in an Unbelieving World," Wayne Brouwer urges us to listen more closely to the wisdom of Jesus and linger long enough before the mirror of the gospel to find the true shape of our selves. Then, under the gentle prodding of the One who cares, we can take new steps toward living life the way it was intended.